The South West Coast Path is pioneering the use of new mobile phone technology to make it easier for people to search for local walks on the go. New signs, which have a QR code and Near Field Communication (NFC) chip, are being added to existing wooden sign posts at key car parks along the coast path to upgrade them to ‘digital fingerposts’. These are now in place at various points along the route in South Devon, including Start Point (above), and will gradually be rolled out across the entire 630-mile trail. Using the digital signposts, smartphone users will now be able to scan and download quickly and efficiently more than 500 walks from the South West Coast Path website. The new digital fingerposts can be found at the following points across South Devon: Torcross tank car park; Start Point car park; Bolberry Down; Bantham; Beesands; North Hallsands; East Portlemouth; and Thurlestone North car park. 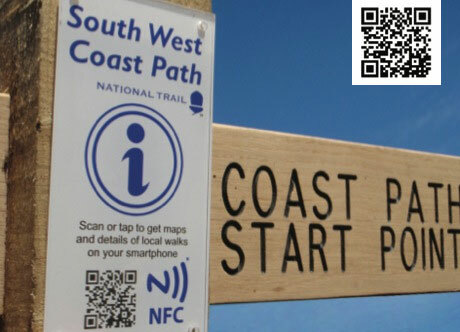 Smartphone users can also download walks via a QR code at key access points on the South West Coast including mainline railway stations such as Barnstaple and Penzance, and smaller branch lines, such as Looe and Exmouth.